My mother Mary is the best! She is a cross between Mother Teresa and Mary Poppins. She is such an inspiration to me of happiness and a love for Motherhood! 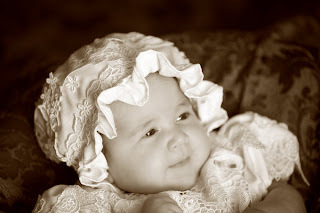 She made the dress and bonnet for Sienna's blessing and my father joked that she hadn't quite hit the 70 hour mark. Lots of hard work and love as usual from sweet Mary. Thanks Mom! You are the greatest! 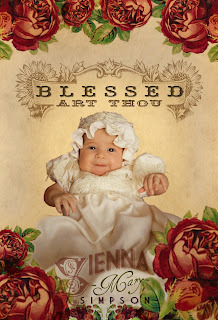 Sunday we blessed Sienna and it was a day of Miracles! Rob and I keep talking about how heavenly the day was with family and friends there. My sweet mom made her beautiful blessing dress. It was a "June Roses" day to be sure! I will post some more pics I promise! I have only taken 7000 since she was born. We are having such a wonderful time with this little angel! 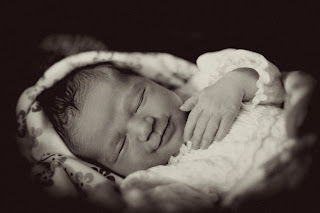 I had to pull myself away from kissing her chubby cheeks to do this post! Rob and I did a pregnancy session and he was making us all laugh so hard that my niece that was doing the video was worried she wouldn't be able to use much of the footage because the camera was shaking up and down from her laughter. Needless to say we got some really priceless footage and shots. Thanks ladies you are the best!! Today Rob and I had the opportunity to speak in sacrament. It is always such a great learning experience. So our topic was charity and it brought many tender memories of my life into view. A few years ago we had a surprise birthday party for my father. We decided to do just adults and have a night where everyone could enjoy each others company and have a nice dinner (we will be having my parents 32nd grandchild)... So there we where in the veranda at the Four Seasons and we all went around the table to told our favorite memory of our dad. Many of the stories I had never heard before as my dad is not much of a boaster about service her renders. The story that came to me when it was my turn to share was about the day he met Rob. My parents where coming up to Utah to visit and I was excited for them to meet my new found hospital hunk, haha. Rob was really nervous and told me "what would you be thinking if your daughter wanted you to meet her boyfriend who she had met in the hospital, had a diagnosis that he would never walk. He is going to think he will have to support us for the rest of our lives." We had a great laugh but it didn't take off the full edge of the hesitation Rob was feeling. My dad came into his room and we had a great chat, he asked if he could offer a prayer before leaving and then asked me if I would walk him to the car. When we arrived in the parking lot I asked him what he thought, thru tear filled eyes he said, "if the Lord saved some one as wonderful as that for you, you are a mighty lucky girl." I believe that because my father views others thru the lens of charity (pure love) that he could see Rob as the stalwart spiritual giant that he is and recognized how wonderful he would be for me. Another gift of charity that was told that evening was from my brother in law Doug. 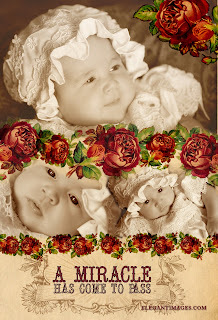 My oldest sister Michelle past away in 1988 in a car accident with her son and she was pregnant. It was devastating to all of us to loose the 3 of them. My brother in law and niece (Krystaly) came to live with us shortly after the funeral and I always loved having a little sister added to the bunch. We loved having Doug and Krystaly around and it seemed so natural to have them in our home, I never wondered until I was older how it was decided for them to come and live with us. Doug told the story that night of coming home after the funeral and looking around their duplex apartment in provo with Krystaly at his side, overwhelmed by the task ahead and wondering how he would get thru this season of his life. He said he heard a knock at the door and when he opened it my father was standing there with a uhaul behind him and said, "Son, I've come to move you home." So tonight as I think of the wonderful examples of charity in my life these are a few stories that I would want to emulate. Rob and I decided a few weeks ago that we would celebrate our 10 year anniversary with a trip to Maui. It was so fun and even though it was on a whim my brother and sister and their spouses where able to join us as well. It was heavenly!!! Of course anything that includes shaved ice and pina colada smoothies is great for me. We soaked up a lot of sun and made great memories. The whales are right off the shore this time of year that and it was amazing. There was some cliff jumping, snorkeling, card games and a fabulous magic show/comedy show that we saw called warren and annabelles. Rob and I laughed so hard our cheeks hurt! PS I didnt cliff jump so no one panic, just my brother in law, Rob didnt see the climb as anything fun either, hahah not much of a hiker! We cant believe that we will be parents in less than 3 months. We are so excited and continue to appreciate all of your thoughts and prayers in our behalf. We love you!